If you think you've tried most, if not all browsers on the market then welcome Visual Explorer to the scene. A sleek browser with an uncluttered design and a rather keen eye on user privacy. Visual Explorer is a moderately fast web browser with tabbed browsing; with the huge downfall of performance for those running Firefox, this browser might even be considered more stable. 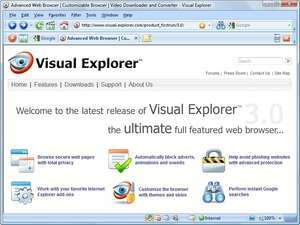 Visual Explorer contains most of the features you might be used to in Internet Explorer but also included a new idea in the Explorer Bar. For security reasons, you should also check out the Visual Explorer download at LO4D.com which includes virus and malware tests. Additional screenshots of this application download may be available, too.